Each year we select two of the returning Favorite 50 Winners, chosen the previous year, to become our Senior Winners. Aside from being the highest honor given at the event, the Senior Winners will be forever imortalized by being featured on the following years event artwork such as t-shirts, souvenirs, advertisments, Ect. Each year we select 50 of our favorite vehicles to become Favorite 50 Winners. Since we judge based solely on what we consider to be our favorite vehicles, anyone can win. As a bonus to be named a Favorite 50 Winner, you are asked to return the following year to compete for the honor of Senior Winner. Albany Rods and Kustoms sponsors the following specialty awards. Joyce Rochester Favorite Corvette Award The "Favorite Corvette" Award is given in Memory of our friend and long standing club member Joyce Rochester. 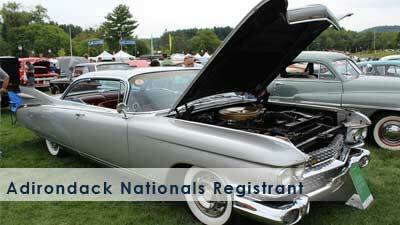 Joyce was a vital part of our car club and the Adirondack Nationals. Over her 17+ years as a member of Albany Rods and Kustoms, she held many positions; Event Co-chairman, Head of Adirondack Nationals Vehicle Registration and lastly, President of ARK. Joyce was also active in her community and was there to help anyone in need. Her love of family, friends, community and ARK were limitless. Joyce was also passionate about cars, her favorite being her 1962 Corvette, a likeness of which is engraved on the front of the Award. Ricky Giusto Favorite Mustang Award - Ricky Giusto was a boy who loved the Adirondack Nationals. According to his parents he was a "Complete Mustang Fanatic". In 1987, Ricky and his mom convinced his dad to sell their '63 Corvette and buy a '65 Mustang GT Convertible. In 1992, their Mustang was an Adirondack Nationals Favorite 50 Winner and Ricky rolled up in his wheelchair to accept the award. Six weeks later, on October 31st, Ricky lost his battle with Muscular Dystrophy. 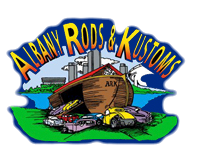 The following year, Albany Rods & Kustoms established the "Ricky Giusto Favorite Mustang Award" in his honor. This award has become well known and coveted by Mustang owners ever since. Jessica Garmley Favorite "T" Bucket - The Favorite T-bucket award is given in Memory of Jessica Garmley. Jessica loved our show and was looking forward to coming to the 2005 event with her parents and their T-bucket. Unfortunately, she passed away from a brief battle with Leukemia before getting the chance. Jessica's Parents did attend the event and were the Winners of the 2005 Favorite T-bucket Award. When we heard their story, we decided to establish the "Jessica Garmley Favorite T-Bucket Award" in her honor. Chairmans Pick - Awarded to the Adirondack Nationals Chairman's favorite vehicle. Presidents Pick - Awarded to our club president's favorite vehicle. Vice-Presidents Pick - Awarded to our club vice-president's favorite vehicle. Ladies' Choice - Awarded by the Ladies' of our club to their favorite vehicle. Club's Choice - Awarded by the members of our club to their favorite vehicle. Mayor's Pick - Awarded to the Mayor's favorite vehicle. Sheriff's Pick - Awarded to the Sheriff's favorite vehicle. The following is a list of our other specialty awards and their sponsors. Favorite Classic - Sponsored by - Newark Car Care Center, Inc. Favorite Hot Rod - Sponsored by - Newark Car Care Center, Inc. 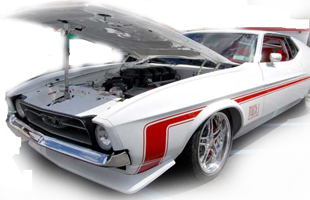 Favorite Muscle Car - Sponsored by - Newark Car Care Center, Inc. 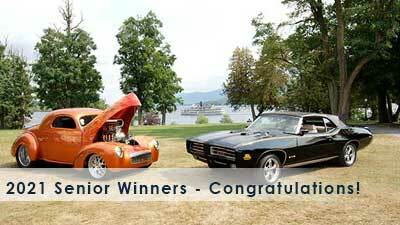 Favorite Pontiac - Sponsored by - Scott Alarm Systems, Inc.
A bonus competition held during Sunday's "Winner Circle" Show. This competition is for Saturday's award winners only. 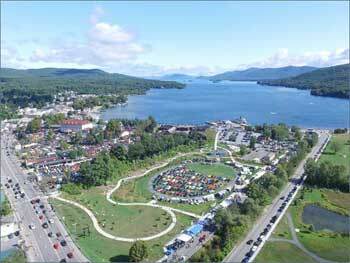 The Staff of the Fort William Henry Resort chooses their favorite vehicle in the "Winner Circle" to receive a prize package.